How to Clean the Refrigerator - Self Cleaning Home Part 7! Hey y’all! So we took a couple of weeks break from adding more routines to the Self Cleaning Home… and that’s OK! I’m a firm believer in rest. So much so, that I take a nap pretty much everyday. Remember that we’re just trying to create habits and not change our lives overnight. We want these habits to stick so the slower we go, the more likely they’ll be a part of lives for the long haul! If you’re new to the series, Start here! Or you can go to the Self Cleaning Home Gallery. Honestly, this NEED NOT BE be a monumental project. I know it can seem like a lot when you open the door and the inside looks like a whirlwind of tupperware and condiment bottles. I keep my fridge cleaning quick and painless. Really that’s the only way I like to clean… free of pain. 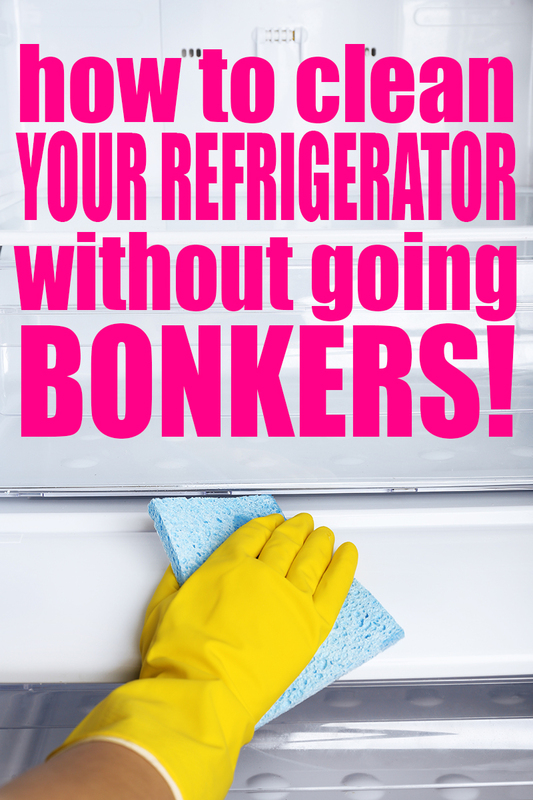 How to clean the refrigerator without going bonkers! So, you want to do this the day before you head to the grocery store. This is vitally important. That way, when you get home with a car full of groceries and you open your fridge, you’ll have a blast of joy when you see there’s a clean and spacious cooling box to put your new acquisitions into. First, pull out the old, yucky stuff. I’m talking the week old pasta sitting there that’s started growing fuzzies and t’aint nobody gonna eat. Throw all that yuck away and wash your containers. Now take a look at the jars of jarry stuff. Check for dates and get rid of anything grody. Now let’s grab a rag and your homemade cleaner and spritz around. Just move stuff to one side and wipe it down. Then move it back to the other side and wipe that side down. No need to remove everything in your refrigerator and be a crazy woman. Exception: You have a drawer or a shelf that has really stuck on gunk and the vinegar cleaner just isn’t doing it. You have permission to clean it in the sink. probably underneath the bottom drawer. Pull that one drawer out and wipe out the bottom. Now, take a look at the walls of the fridge and quickly wipe any drips or spills down. Basically just spot clean the inside so there’s no brown drippy mess running down the back of your fridge. Yuck. Finally, give the outside a quick swipe down and you’re done! An imperfectly cleaned refrigerator is heap-loads better than one that never gets any love, so give yourself a big dab and congratulate your efforts! This should take you no more than 5-10 minutes. Set a timer and see just how quickly you can get it done… and no perfection. Not allowed here, yo! P.S. Have any other fridge cleaning tips? Let me know down in the comments below! You can try to clean it with vinegar – it really kills off the bad smells. Also to prevent odours you can place a small bowl with coffee it’s simple and it works.